Shiver We Timbers! is now open, and the Good Ship Peripatetic has already had two adventures on the high seas! 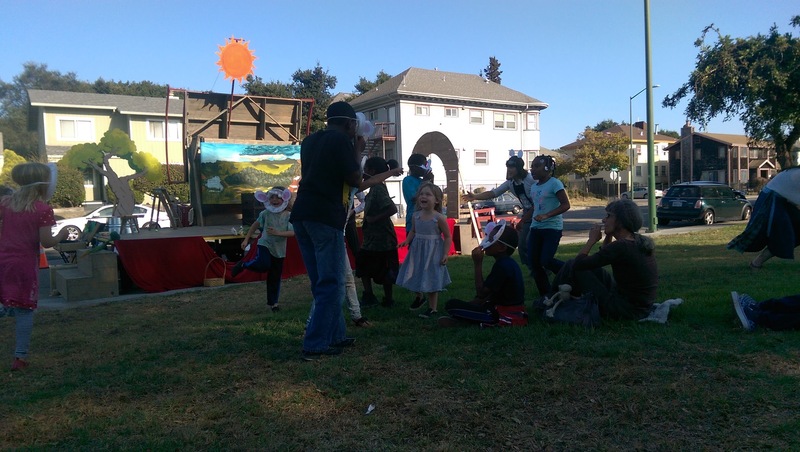 Great audiences and glorious weather turned out for our opening weekend, at Dimond Park in Oakland on Saturday, and Noe Valley Town Square on Sunday. 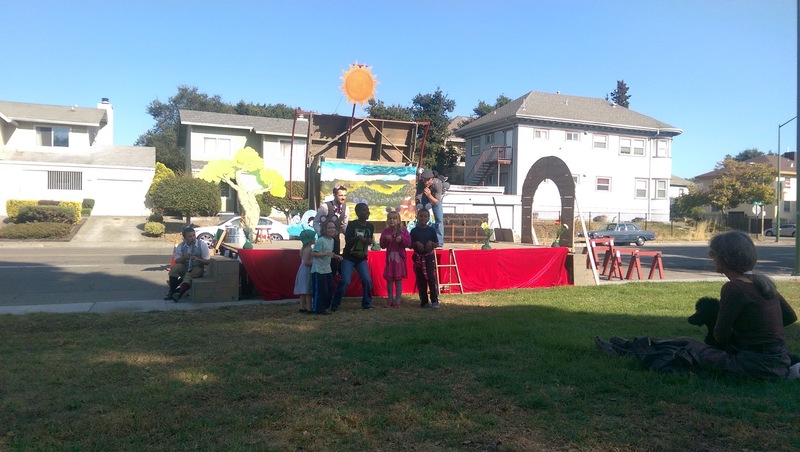 Thanks to Oakland’s Department of Parks, Recreation and Youth Development, and to S.F. Recreation & Parks for hosting us at these gorgeous sites, and to the Noe Valley Association for helping to get the word out. We’re looking ahead now to our next ports of call: Glen Canyon Park, San Francisco, at 3pm on Saturday July 14; and Niles Town Plaza in Fremont at noon on Sunday July 15. Click here for the full schedule, with links to maps! Glen Park fans, have a look at the cool events that the Glen Park History Project has in the works — including a suffragette walking tour of Glen Park the morning of our show. Over in Niles, train enthusiasts AND silent film buffs will find lots to discover. Sunday’s show happens to coincide with Charlie Chaplin Days, so you may see a bunch of Chaplins dressed in homage to one of our favorite knockabout clowns! Our Niles performance is generously co-sponsored by the Niles Main Street Association and the Alameda County Library Foundation, as part of the 2018 Niles Summer Concert Series. Remember… start time in Niles is noon. Here’s a link to the full schedule! As always, check out our Instagram, Facebook, and Twitter feeds for real-time pirate adventure updates! Arrrrrrgh! 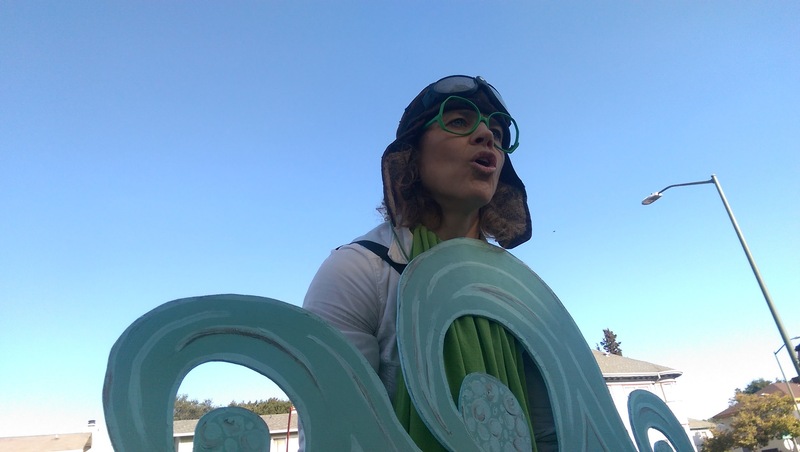 The Peripatetic Players opened Aesop Amuck this past weekend with shows at DeFremery Park in Oakland and the Noe Valley Town Square in San Francisco. Next stops: Hayward at 1pm on August 8 and Glen Park, SF at 2pm on August 9. Here’s our full schedule of performances… and you can help keep us going by donating to our Kickstarter campaign! And now — pics from the show! Thumper as a frog ready to have some fun in the frog pond during AESOP AMUCK. Opening Weekend – and no BART between SF & the East Bay! What is a Peripatetic Player to do? We’re looking forward to playing at DeFremery Park, Oakland this Saturday August 1 @ 5pm, (special early-evening opening night!) and the Noe Valley Town Square this Sunday August 2 @ 2pm! But BART service this weekend will not travel between San Francisco and the East Bay! In addition, the West Oakland BART Station, the closest station to DeFremery Park, will be closed. But GOOD NEWS! There will be more frequent BART and bus service throughout both sides of the Bay — just not between them. Biking to DeFremery Park or to Noe Valley is a great option! But BART asks that you don’t bring bikes on the Transbay bus bridges this weekend. (The regular AC Transit Transbay Bus routes do allow bikes.) There will be more frequent ferry service across the Bay — it’s a fantastic ride both on bike and boat. Click here for more info for cyclists. If you must drive, street parking is usually available at DeFremery Park, but quite difficult at Noe Valley. It’s always a good idea to plan some extra time if you’re driving. We can’t wait to perform for you! Here’s our full schedule of performances… and a photo of part of the Mouse Family, ready to go! Thumper jumps high to escape the Dingo, played by Samuel Peaches in O BEST BELOVED at Noe Valley, August 2014. Photo by Tim Guydish. Meekins, Guy Hank, Samuel Peaches and Thumper pantomime driving a speeding space vehicle in a scene from SHAKESPEARE OR SPACE WARS. Photo by Tim Guydish. Princess Gwen as The Elephant’s Child in O BEST BELOVED. Photo by Serena Morelli. AESOP AMUCK at Noe Valley Town Square, August 2, 2015. Photo by Charlie Gray. Guy Hank as the Lion in AESOP AMUCK. Photo by Tim Guydish. A battle rages on the streets of Verona in Shakespeare or Space Wars. Photo by Serena Morelli. Pictured: Thumper (Joan Howard) and Princess Gwen (Marlene Yarosh) on the Capulet side; Samuel Peaches (Casey Robbins) as Prince Escalus — stuck in the middle — and Percival Perkins (Soren Santos) and Meekins (Samuel Bertken) as Montagues. Photo by Serena Morelli. Princess Gwen (Marlene Yarosh) as Princess Gweia delivers a surprise message from the trap door in Shakespeare or Space Wars. With Meekins (Sam Bertken) as Meek-3PO, Percival Perkins (Soren Santos) as Perk Piewalker, Samuel Peaches (Casey Robbins) as Obi-Wan Peachobi, and Thumper (Joan Howard) as Thump2-D2. Photo by Serena Morelli. The Players co-exist in two worlds: Princess Gwen (Marlene Yarosh), Guy Hank (Paul Collins) and Thumper (Joan Howard) are ready for their roles as Princess Gweia, Lank Guywalker and Thump2D2 in “Space Wars,” while Mr Peaches (Casey Robbins) and Meekins (Sam Bertken) rehearse their monologues for “Romeo and Juliet.” Photo by Rebecca Longworth. Thumper (Joan Howard) as Tybalt gets thrown out of the party thrown by Lady Capulet, played by Percival Perkins (Soren Santos) in Shakespeare or Space Wars. Photo by Serena Morelli. 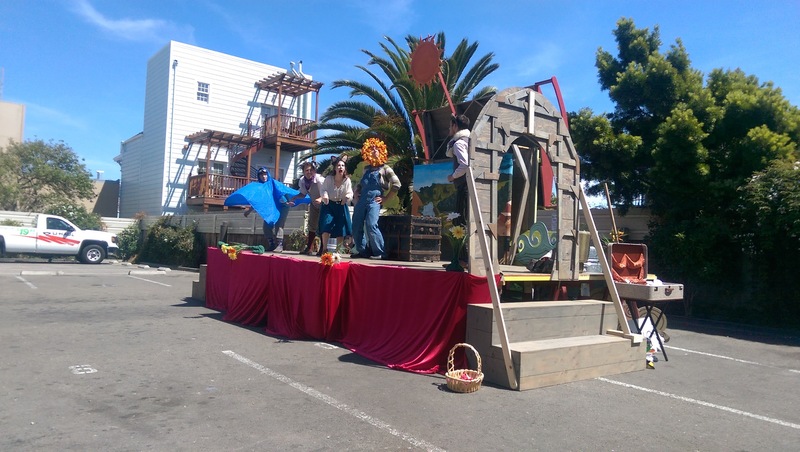 The Peripatetic Players performing AESOP AMUCK in Santa Clara, August 2016. Photo by George Doeltz. Princess Gwen as a hungry fox in AESOP AMUCK. Photo by Tim Guydish. 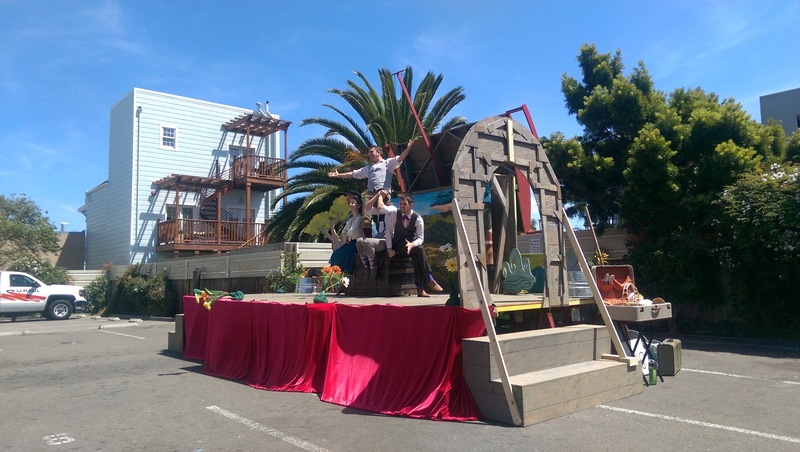 The Peripatetic Players set up their stage, FluxWagon, in front of the Port Costa School during the 2015 Bay Area tour of AESOP AMUCK. Princess Gwen as Princes Gweia (Marlene Yarosh) and Thumper as Thump2D2 (Joan Howard) listen to Samuel Peaches (Casey Robbins) pontificate about the genius of Shakespeare. Photo by Rebecca Longworth. 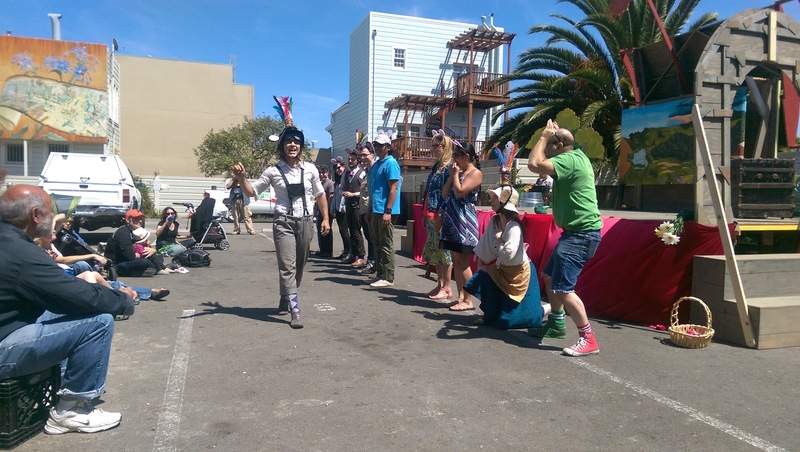 The Peripatetic Players introducing AESOP AMUCK at Noe Valley Town Square, August 2016. Photo by Tim Guydish. Frogs get more than they bargained for from a simple game of skipping stones in AESOP AMUCK. Photo by Tim Guydish. Meekins (Sam Bertken) as Romeo, Princess Gwen (Marlene Yarosh) as Juliet, and Thumper (Joan Howard) as Tybalt in the very nearly tragic ending of Shakespeare or Space Wars. Photo by Serena Morelli. 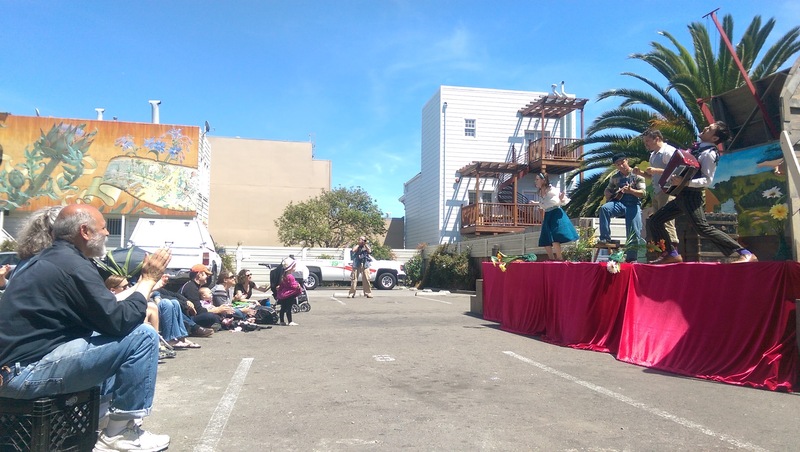 Meekins gets a serendipitous fly-by from a pigeon in Noe Valley during a performance of O Best Beloved in 2014. Photo by Tim Guydish. The Mouse Council is at a loss over what to do about the local cat in AESOP AMUCK. Photo by Tim Guydish. Thumper (Joan Howard) and Meekins (Sam Bertken) meet with the disapproval of Samuel Peaches for bringing spaceships to Verona in Shakespeare or Space Wars. Photo by Serena Morelli. Click here for updated dates, times, and locations! Peer in on the Players Process! Enter your email address to follow the Peripatetic Players' blog and receive notifications of new posts by email. Hear from the Players themselves, and be the first to get details of upcoming shows! These happen a bit more often than newsletter updates, and more often near shows. Particularly Obstinate Obstacle Course-A-Thon Fundraiser Pledge to support your favorite Player as they face obstacles both real and imagined during our May 20 fundraiser!